Hephthalite. Silver drachm imitatating Hormazd IV, with two countermarks. ca. 7th AD. The coin being imitated is a Sassanian drachm of Hormazd IV who ruled from AD 579-590. There are two Hephthalite countermarks. Mint : The mint mark does not make sense for an official Sassanid coin, but it appears to be an incorrectly written designation for BISH. This odd form of the mint mark is what suggests this is an imiatative type, rather than a countermarked official Sassanid coin. These coins were probably struck in Afghanistan. Date : Year-11 which would be AD 590 if this were an official Sassanid coin, but as this is an imitative coin it could be made any time for a century or so after that. These are generally said to be 7th to 8th century coins, but these are so close in style to the official Hormazd IV types that they cannot date much after the official coins. Size : 29.5 x 32.3 Weight : 3.62 grams. Grade : the base coin is good Fine / about Fine, the countermarks are both gVF. Obverse : Head of Hormazd VI right, with an inscription naming him around. Countermarks : The obverse is countermarked with a King's head. 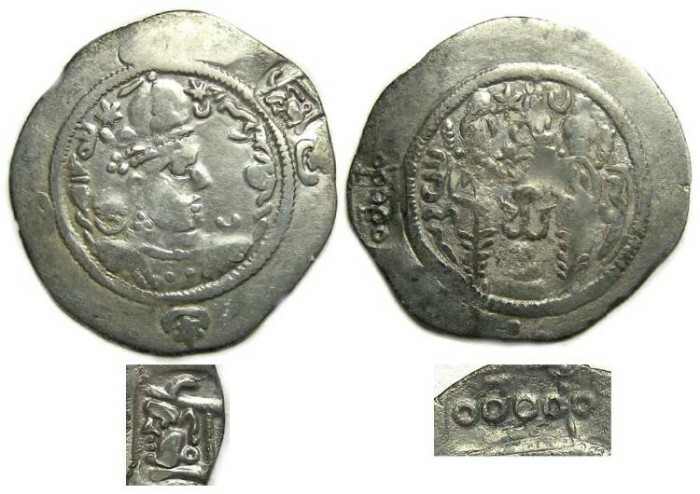 This same countermark is seen coin Hephthalite coins from Afghanistan that imitate coins of the Sassanid King Peroz (see Mithiner Ancient #1465 to 1480). The reverse has a countermark that appears to be a stylized version of the Hephthalite tribal name "ALChOON" which appears on many Hephthalite coins.